> Support HDMI 1080p or 720p output(HDTV). 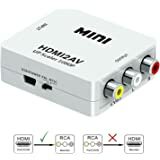 > Provide advanced signal processing with great precision,colors, resolutions, and details.Plug and play,Mini size. 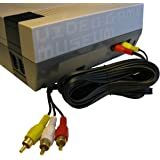 > Support PAL, NTSC3.58, NTSC4.43, SECAM, PAL/M, PAL/N standard TV formats input. > Note: Please hook up the USB power cable (included) to 5V power source before use.1 year limited warranty. 2. With the mode indicator visible, press and hold for 2-3 seconds then let go to cycle to the next mode. I had to cycle twice to get to 4:3. Will be using this for my 8-bit NES and other systems with composite video outputs. 3.0 out of 5 starsGreat for Displaying 4:3 Content, average quality converter. The majority of these converters are hit and miss. I have a cheaper one(cost me about $17 two years ago) with same dimensions but plastic. 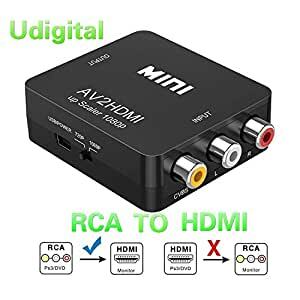 The advantage of this converter is that it is one of the very few that will display your 4:3 content in the proper aspect ratio even though it is being output through HDMI. 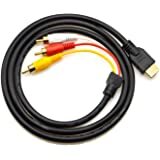 I bought this for my laserdisc player(CLD-59) so I could feed it through my Onkyo receiver's HDMI inputs which which in turn displays it through my 1080p projector(Epson 3020e). The first images I have shown are from a 30 year old laserdisc of Abbott and Costello Meet Frankenstein. My phone camera doesn't do the picture justice, but to be clear, I can't say the image is HD quality despite what my projector menu displays(notice the 1920x1080 resolution). The third image is from a 25 year old LD of F/X 2. The fourth is a VHS image of Star War Special Edition. I used these pics to show the converter's ability to display 4:3 correctly. This is done by pressing the "FORMAT" button on converter box. It's a little tricky ,as you have to hold if it for few seconds and release while you "scroll" through the choices. I don't view much VHS content these days, but I wanted to confirm that it works on other older video equipment beside my LD player. I even did my VCD player which works as well. I will keep this in it's 4:3 setting so I can use it on all my 4:3 laserdiscs(for the record it does widescreen as well). i will just switch out the other converter when i want to view widescreen. Only get this if you are adamant about viewing your fullscreen versions of tv shows and movies. As far as video quality and reliability(occasional drop outs that last 4-5 secs. ), it is an average converter. Hope this helps. 5.0 out of 5 starsDecent upscaler with real 4:3 support! This is the only composite -> HDMI converter I found that correctly supports 4:3 output - perfect for our old game consoles. Everything else out there stretches the output to 16:9. Video quality is just OK, with lots of white/black crush, but I don't think I'm going to see much better in this price range. This came and did just what advertised. 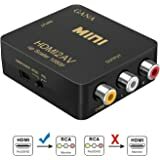 Recently, I purchased a DVD player with no HDMI access. I couldn't get the RCA hook up to work and and had to purchase this unit in addition to the DVD unit. It worked perfectly. I have an older Vizio TV with only two HDMI access points and will be adding another unit that adds three additional access points......cheaper than purchasing a new TV.....lol. I set it up on the 720 and was good to go.........from start to finish to install..........less than a minute. I have no problem recommending this unit..........Research these prior to ordering to save you a ton of headaches. THIS IS AV TO HDMI..........IF IT WERE HDMI 2 AV, THE ITEM WOULD NOT HAVE WORKED. IT APPEARS PICTURE FLOW CAN ONLY GO ONE DIRECTION......HOPE THIS HELPS. 5.0 out of 5 starsProduct is as described, but be careful! 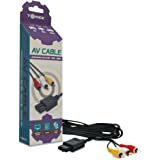 This product is perfect for those who want to use this with their game systems or projector, I use it with my Elgato and it helps greatly for when I want to record gameplay footage off my game systems! 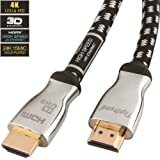 Be careful though because they sell 2 versions of this product and if you get the one where the one that is HDMI to RCA, it won't work with an Elgato or game system, so be warned and careful!